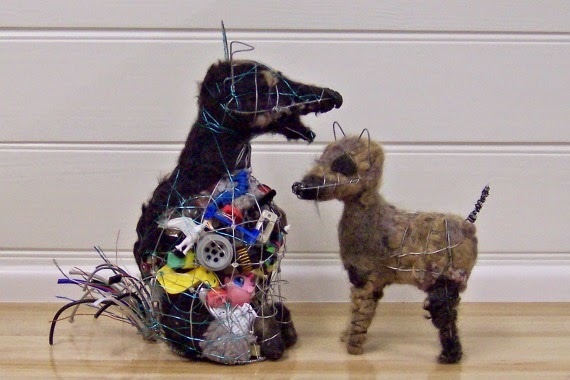 Every year the City of Hobart Council has an exhibition called Art From Trash. Its one of my favourite events of the year. 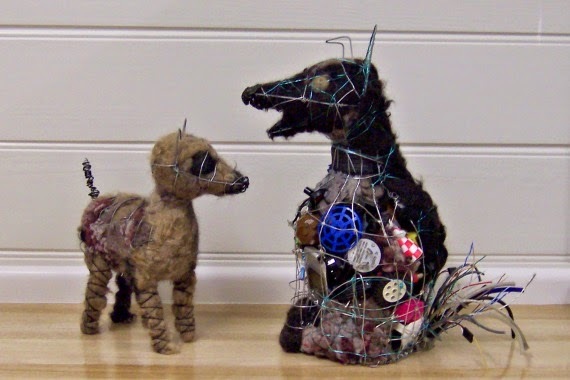 This year I entered my Junkyard Dogs – partly inspired by the little dog I made during my art course last year. Remember Hair of the Dog? Let me introduce you to them properly. 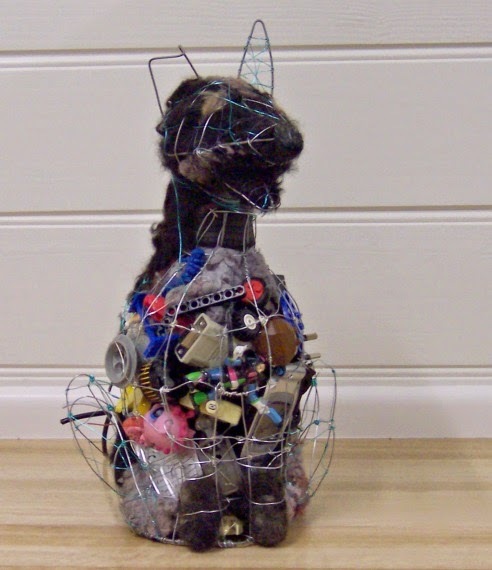 First there was Tiny Terrier, the first art from trash dog. 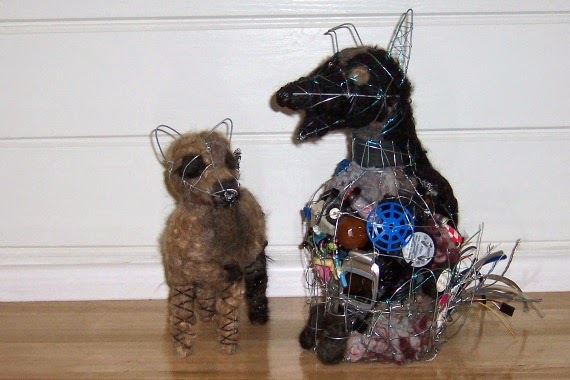 He’s made of a wire frame and felted dog hair… plus some dryer lint and possum fur I found in the woodshed. 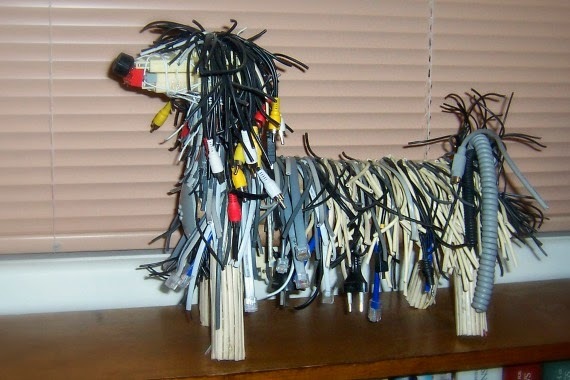 He’s made of electrical, phone and computer cables. See, while cleaning up the house a while ago I found all these cables which belonged to printers, phones, computers and stereos I haven’t had in years. A whole box of them. I actually put them on the porch to take to the rubbish. Then I had second thoughts. I could make something from them! So I made another dog. 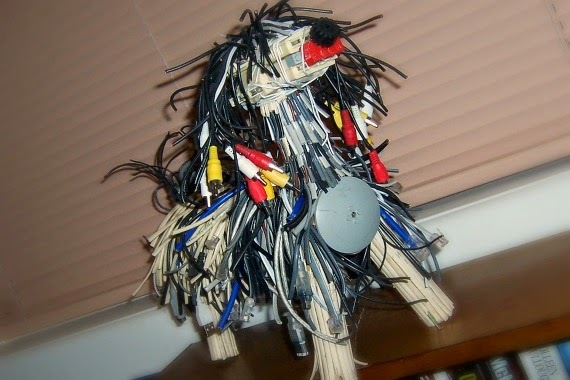 He’s made of a cardboard frame with all kinds of cables and a few legos. 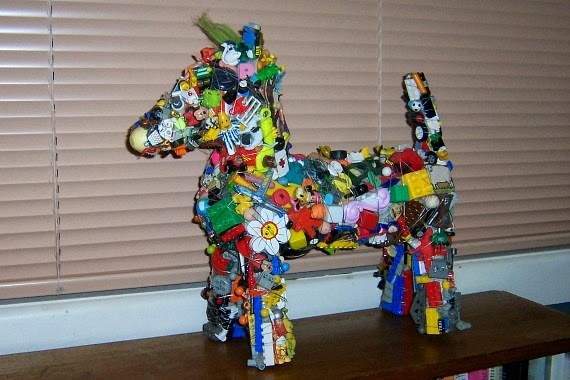 He’s made of toys and a bit of wire on a cardboard frame. A whole lot of small toys and toy parts a friend collected from her daughter’s bedroom floor. She was going to throw them away but of course, I could do something with them! Lastly there’s Bubble and Squeak (the name kinda says it all). 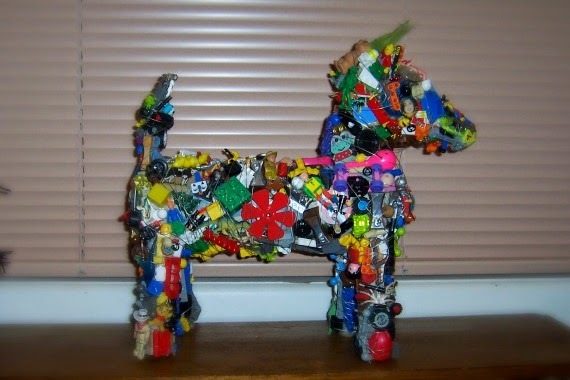 He’s a mix and match of all the materials I used on the other three dogs. 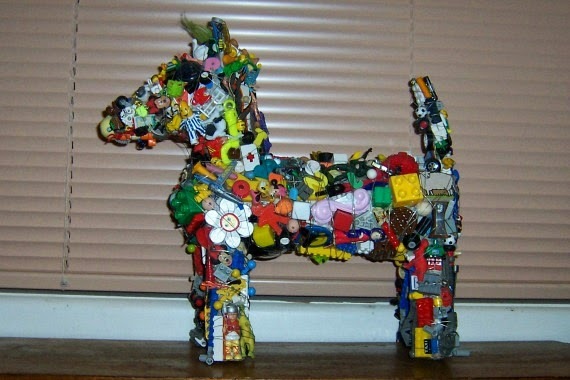 Befitting a junkyard dog. 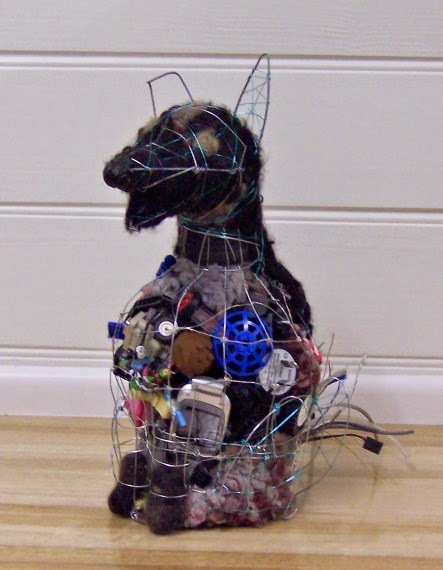 He’s made of a wire frame, a hollow bowl shape which holds all kinds of thing… toys, a broken mobile phone, chargers, old ink cartridges, electric plugs. 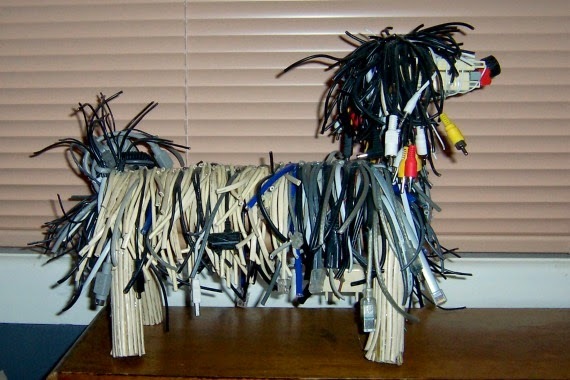 His tail is made of cables and an old metal spring. His legs are all hollow wire frames, but front legs end in felted dog hair paws. His head is full of felted poodle hair and dryer lint, which flows down to cover half his back. These guys will be in the Long Gallery in the Salamanca Art Centre till June 4th. I already know Tiny Terrier won’t be coming home and I must admit I felt a bit sad saying goodbye to him. I believe Toy Terrier is also going to a new home. Seriously, I don’t have space to keep everything I create, but sometimes its hard to say goodbye! This entry was posted in Craft, repurposing, thrifting by zefiart. Bookmark the permalink.